Andrew Heming's Blog: The Top 7 Fitness Deceptions. Are You Falling For Any of These? The Top 7 Fitness Deceptions. Are You Falling For Any of These? I’ve got a confession to make: I don’t like the fitness industry. Yes, I have been part of it for over 18 years, and yes I have many colleagues in this industry that I admire and respect. However, I’m in the fitness/strength & conditioning industry not because of what it is, but because of what it can be. Proper exercise, nutrition and lifestyle habits can be absolutely life changing! The problem with the industry is that it is way too easy to make a quick buck – at the expense of innocent, hard-working people who are trying desperately to see results. If you are working hard to improve your aesthetics, your performance and/or your health, you have to guard yourself against these 7 fitness deceptions. The truth: while soreness may happen as the result of proper training it is not the goal. It is very easy to make someone sore. To make someone better is a whole other story. Another classic deception is muscle confusion. Change things up, keep the muscle guessing! People love this because every workout is fun, unique and different. The problem with this is that while it is fun for your mind, your muscles don’t get confused. The truth: staying with your current training program for a reasonable amount of time (e.g. 4-8 weeks) and focusing on progressing it will give you much better gains than randomly switching things up every time you hit the gym. The easiest way to make a quick buck in this industry is to simply tell people what they want to hear. Most people focus too much on feelings when they train and not enough on results. If they feel the burn, it must be working – right? Maybe. If you are doing bodybuilding or endurance training, you will definitely feel the burn. If you are doing low-rep strength or power training power training you won’t. Also, you can feel the burn as the result of good training (e.g. 20-rep set of heavy squats) or the result of bad training (e.g. a million reps of partial squats with an 8lb group fitness padded bar on your back). Anything will burn if you do it long enough. However, in most cases harder, not-longer is what you need to get the results you want. In this technological age, more and more people are bringing their gadgets to the gym. They have special monitors, watches and apps to track all kinds of things. Now, some of these can be good. For example, with my athletes, I like them sprinting with an electronic timer, jumping with our jump-tester mat and doing power movements when a Push trainer than measures their bar speed and power output. However, countless people improved their aesthetics and performance without these gadgets. Also, they are only helpful if they do not distract you from the most-important things like hard, focused training! Bad-different: unstable surface training is a classic example of this. About 15 years ago, the trend was to do all your training on a ball, wobble board or Bosu. People loved it – it was fun, unique, different and challenging without really being hard. The problem: we don’t live on round, unstable surfaces. Also, when you try to do strength training on these things, you end up decreasing the work of your target muscles because you have to contract all your other muscles to keep from falling off. Different-different: sometimes you are in a rut and need something different to spark new progress. This can be switching to an equally-effective exercise (e.g. back squats to front squats – not back squats to leg extensions) or changing your style of training (e.g. whole body vs. split routines). Good-different: this is when you add something to your training that is new to you AND very effective. A classic example is loaded carries. While they are not new, they are new to most people. They provide a fresh new change to your workout and are extremely effective. Want to sell a useless piece of fitness junk? Just pay a celebrity to endorse it for you. The problem with this is that many people fail to realize that genetics plays the biggest role in how a person looks. Sure there are many celebrities who really work hard in the gym, but this is only icing on top of amazing genetics. Also, few if any celebrities actually transformed their bodies using one of the silly products they promote. How about you? What other fitness deceptions have you seen in the industry? I welcome your comments and questions below or on my Facebook Page. Hi I'm Andrew and I help people look and feel like athletes. This blog will provide you with the tools you need to burn fat, build muscle and improve your performance. Enjoy! 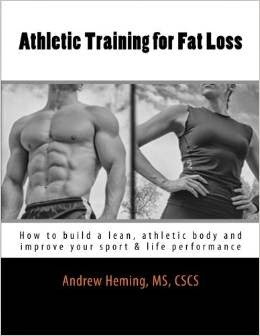 "Athletic Training for Fat Loss"
Copyright 2012 Andrew Heming and Heming Training. Awesome Inc. theme. Powered by Blogger.